My mother was a Pentecost before becoming an Adventist. She raised me up in Pentecost faith. There was a non christian girl in my church who became christian. She initially attended a Pentecost church. Her pastor announced her one day that he is going to anoint her with gift of tongues. She was not convinced of this experience. Eventually when she was given a bible study by an SDA pastor she became an Adventist. As I grew I became more concerned about this pentecostal movement as millions of people are deceived by their false gift of Tongues and false miracles. When I meet these pastors I reasoned with them of their belief from scriptures. One day I was in my aunts place where there were two pastors shouting and praying with what they believed as gift of tongues. Once the prayer was over I started talking with one of the pastor. While conversing I asked about his children. He informed that his son completed his Bachelors in theology in his hometown and now he is sending him to Bangalore city to learn English. I asked him why he has to send his son to Bangalore to learn English. Since they have the gift of tongues they can speak English with that. With this question both the pastors were shocked and became dumbfounded. I told them when apostles were given gift of tongues they were able to speak in languages (tongues) which they don’t know. I have been to many pentecost church where they employed professional translators to translate the sermon in English and in other languages. Why none of the pastors can speak in other languages with their gift of tongues. To know more about true gift of tongues. Couple of years back two Jehovah Witness ladies came to my house upon my invitation. They asked me why I invited them and what I wanted to discuss. They answered in Watch Towers translation this is made clear that the word Almighty is pointing to God the Father and not Jesus. To this they answered “you seem to know everything then you don’t need us” and rose up to leave. Since I know the conversation is going to end I asked the final question “How can you trust an organization which repeatedly made failed predictions of the date of Jesus second coming. They repeatedly set dates like 1914, 1918, 1925, 1953 and 1975 and all of which failed. How can I trust this organizations teaching when their interpretations failed and they are changing their position of what they believe. They left hastily in anger. According to non trinitarians Jesus came after the Father. So Father is the first being and Jesus is the second being in this universe. Is it not a lie; When Jesus being the second person in this universe and first being God the Father how can He claim that He is first like God the Father. Also God the Father claims “beside me there is no God.”; Bible says that Jesus is God. Where is the error here. Is it with Trinity or non trinity? 3. Arians like Jehovah Witnesses – Believe that God the Father alone existed throughout eternity; Jesus Christ is the first creation of God and Holy Spirit is the Power of God. 4. Semi – Arians like WCG, CLG – Believe that Jesus came out of Father and Holy Spirit is another form of Jesus. I have tried to cover most of the questions on trinity. Will try to add more questions and answers on this topic. 1. Is Jesus equal with God? 2. Is not Jesus came out of Father because Bible calls Him as begotten? The word begotten does n’t necessarily mean ‘gave birth to’. Paul says that Jesus was begotten in that he hath raised up Jesus. For the plan of salvation Jesus, the second person in the Godhead, offered Himself to die as penalty for Sin. It is decided that God will raise up Jesus after His death; in this Jesus was begotten by God as His Son. The proclamation in Heb 1:5 shows that Jesus and God existed without the Father and Son relationship before God announced Jesus that He will be His Son. 3. Is not Bible call Jesus as the only begotten son of God. When Jesus is the only person whom God gave birth to and rest were created? Isaac is called as the only begotten son of Abraham when Abraham had another son. 4. Is not Jesus the first born of all creatures? if you see verses like James 1:18 tells us that the firstfruit among someone need not be the literal first person it can be the best among them. Another example is when 144000 are called the firstfruits among saved. Now if we take the firstfruits to be literal first persons the above passages will give us a contradiction. Few more examples is when David is called as firstborn among Kings. Psa 89:27 Here the firstborn does not mean that the firstperson who was born as king. Jesus is called as first born among creatures in col 1:15; does that mean he is the first ‘born’ creation no instead both the passages tell us that they are the best. David among Kings and Jesus among all beings. Here the best of the oil, the best of the vine and of the wheat are called the first fruits. Even though Moses Jud 9 and 24 elders Mat 27:52, 53 had resurrected before Jesus; Jesus is the first fruit among them because he is the best. The reason being; He became a created being; From someone equal with God; He created Himself to be a humble being. We know from John 1:3 that Jesus created Himself. All created things are created by him; There is no created thing which is not created by him. If Jesus is a created being then logically according to John 1:3 Jesus created Himself. 6. Is not Jesus the beginning of creation of God (Rev 3:14) ? Answer to question 5 answers question 6 also. Jesus created himself to be an Angel Michael -the first created being. 7. Is not Holy Spirit the spirit of God and not a separate being? The Holy Spirit makes intercession for the saints and God hears what the Spirit is praying for He (Spirit) makes intercession according to the will of God. 8. Does not Bible refer the Father alone as God? It does always refer Father as God. It is because the triune Godhead foresaw the rise of sin and decided to put forth the plan of redemption. Sin is the transgression of God’s law. God’s law is expression of His Character. Opposite to God’s character is evil. Sin is evil. The plan of redemption is this. God made universal law which is the expression of His character. As long as the created beings reflect His character of love there will be universal peace and harmony among His subjects. When His Laws are broken then there will be chaos and sufferings. These 3 eternal beings foresaw that. So one of them became an Angel called Michael. He is the Chief of all Angels – The Archangel. He will be subject to the law and serve God and set an example to others. When other created beings see that God Himself is subject to the law and will learn how delightful and mandatory it is. The third person of Godhead will work from the heart of create beings and help them to obey the law and reflect God’s character. He will be the representative of Godhead among living beings. Christ will be the representative of living beings in the Godhead. 9. Did not Isaiah tells that besides God there is no other God? If you use that statement to teach that Jesus is not God then we will be contradicting lot of other statements.For example John 1:1 says that Jesus is God. In Isa 43 the Godhead is speaking for themselves addressing with the common name Jehovah. 10. How do we know that there 3 persons in Godhead? 2 cor 14 The grace of the Lord Jesus Christ, and the love of God, and the communion of the Holy Ghost, be with you all. Amen. Matthew 3 16 And Jesus, when he was baptized, went up straightway out of the water: and, lo, the heavens were opened unto him, and he saw the Spirit of God descending like a dove, and lighting upon him: 17And lo a voice from heaven, saying, This is my beloved Son, in whom I am well pleased. 11. Did not Jesus promise to return as another comforter which is Holy Spirit. It is Jesus Himself who came since He promised to return? Jesus said when His discplies saw Jesus they saw the Father similiarly Jesus abides with us through the third person of Godhead – Holy Spirit who is His representative. That is why He is called as the Spirit of Jesus. *1874. Pastor Russell and his group of Bible Students are disappointed when Christ did not return as expected. *1878. They are again disappointed when the Resurrection does not take place but then teach that both events did take place – but were invisible. 1879. Zion’s Watchtower and Herald of Christ’s Presence commenced to teach these new found ‘truths’. 1886. First volume of the Millennial Dawn series published. Later called Studies in the Scriptures. *1914. Armageddon and the End of the World does not take place nor any of the other events as foretold. *1915. Abraham, Isaac and Jacob etc. are not resurrected as predicted. 1916. Pastor Russell dies and is succeeded as president by Judge J.F. Rutherford. 1917. The Finished Mystery confirms the *1874 and *1878 dates. It foretells the *1918, *1920 and *1925 dates. *1918. Christendom and its churches were not destroyed as foretold. *1920. The republics did not disappear as had been foretold. Millions Now Living Will Never Die, foretells the resurrection in * 1925 of Abraham and the Princes of old. 1924. The Way to Paradise foretells how after* 1925 people can call up Abraham in Jerusalem and apply to have their loved ones resurrected. *1925. It had prophesied that in 1925 theKingdom would be set up on the earthand Abraham, Isaac and Jacob etc.would be resurrected to administer it. The mansion “Beth Sarim” (shown in the above picture) was built in California for them to occupy eventhough the book The Way to Paradisep. 225 had described how Abraham would live. None of the foretold events come to pass. 1929. Beth Sarim is built. 1931. The name Jehovah’s Witnesses adopted. 1942. Rutherford dies in Beth Sarirn. N. H. Knorr becomes president. 1945. Blood transfusions begin to be condemned. The first edition of the New World Translation of the Christian Greek Scriptures appeared in 1950. It was the work of their own Translation Committee. Only one, Fred Franz, had sufficient knowledge of the Bible languages to attempt a translation of this kind. He had studied Greek for two years but was only self taught in Hebrew. They used the master Greek text of Westcott and Hort which is based on only 5% of the manuscripts which included the Vaticanus and Sinaticus. These two corrupted manuscripts commissioned by Constantine leave out thousands of words and whole clauses. They contained the Aprocrapha which supports prayers for the dead. Westcott and Hort did not believe in teachings such as Creation, Heaven, the Second Coming, miracles or inviting people to receive Christ as Savior. On the other hand they believed in Mary worship, prayers for the dead, purgatory, communism, in contacting demons, and decided between variant readings on the basis of their “inner consciousness”. 1952. Vaccinations are now allowed, but not blood transfusions. 1966. Baptisms are at an all time low so the new date of *1975 is set for the End. 1967. Organ transplants are termed “cannibalism” and forbidden. 1969. The Kingdom Interlinear Translation of the Greek Scriptures. It reveals many contradictions and errors in the New World Bible. 1972. April 1, Watchtower, claims the Watchtower Society is Jehovah’s Prophet. *1975. “The wicked world’s end” does not come as expected. 1977. N. H. Knorr dies after witnessing the devastating effect of the *1975 date failure. He is succeeded by Frederick W. Franz. 1978. The Society suffers a -1.4% membership loss as a result of *1975. 1983. Raymond Franz writes Crisis of Conscience. It destroys faith in the organization, as it reveals many ‘inside’ problems and errors. 1984. 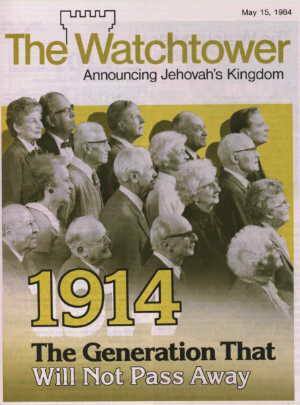 The Watchtower, May 15 has an article, 1914 – The Generation That Will Not Pass Away. It is still teaching that the End will come within a generation from 1914. 1989. You Can Live Forever in Paradise on Earth (1989 ed.) page 154, has this illustration: People of 1914 will see the end. 1996. With this new “truth” the urgency of the generation limitation was gone and worldwide service hours dropped this year by 10 million. 2001. Membership increase only 1.7%. Service figures the lowest in years. 2002. Many European countries reporting losses. 2003. Only 258,845 baptised. This is the lowest figure for 15 years.